Bearing a wooden gable roof, photos inside the chapel at Ballara Receptions were one of the best chapel pictures we have processed to-date. This Victorian style church has a very simple interior design which goes a long way in making the Bride and the Groom as the main focus in each photo. We also particularly love the exterior of this chapel, making group photos at the surroundings having a European feel to it. 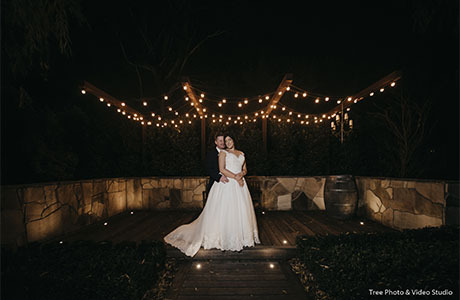 That aside, Ballara Receptions is one of the places where night-time photography will produce really brilliant photographs! Rows of lights were strategically equipped on their gazebos, making night party amazingly beautiful in pictures. We believe Ballara Receptions wedding photography was one of the smoothest jobs we had the honour of completing, thanks to their first class garden and carefully thought lighting fixtures. For those who love wedding photos with some Victorian element in them, we would definitely recommend this place. Knowing how elegant this venue is, we eagerly look forward to your Ballara Receptions wedding photography and we are happy to cater to any special requests. Hit the Contact Us button and let us hear your story!